In 1983, I lived in the building in the center of this photo. That's Tower B of the Litchfield Towers complex on the campus of the University of Pittsburgh. I lived on the seventh floor and it was my first experience living on my own. 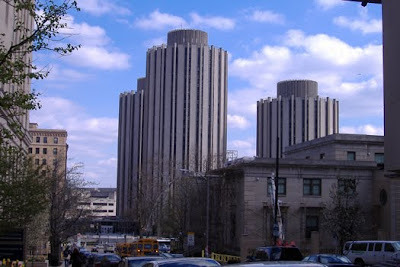 The Tower B was 22 stories tall and it was home to nearly 900 freshman. There were 40 of us to a floor and all 40 of us shared a single bathroom. As I remember it, there were ten sinks, ten toilets, eight showers and eight urinals. Oh such times were they. A great friend I made in those early days of the fall of 1983, was Jerry. Jerry lived down the hall and together we figured out a thing or two about what it meant to be out on our own for the first time. Through the years, Jerry and I drifted apart and I hadn't heard from him in about 20 years when Facebook landed on my lap about a year-and-a-half ago. As is true for a whole lot of people from my age group, Facebook has been a real boon to reestablishing contact with friends for way back when. Jerry and I found each other a couple of months after I joined up and it's been a real pleasure to reestablish contact. I love reading about his daughters and he seems to get a kick out of what I do here. The other day, he wrote me a note that was prompted by something I'd written about bath design. 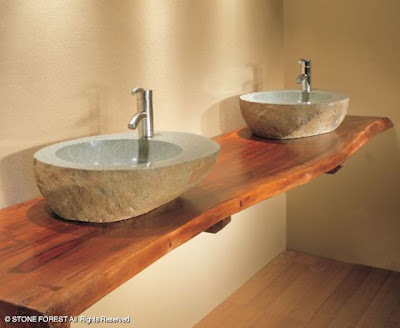 He told me that he and his wife had designed their master bath around a pair of Stone Forest vanity sinks. They'd fallen in love with those sinks and made a room to accommodate them. Now that's my kind of people! 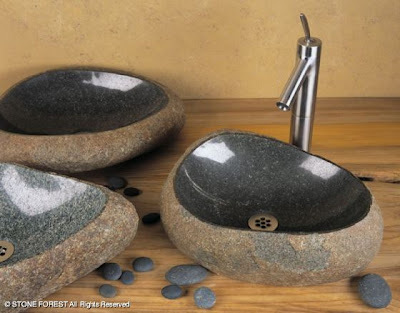 He hasn't told me which Stone Forest sink it was that they love so much but there are certainly enough to choose from. 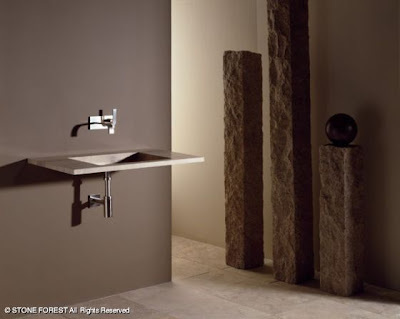 Stone Forest makes contemporary, sculptural sinks, vanities and bathtubs from stone, bronze, bamboo, copper, iron and hardwoods. It's their stone projects that really capture my imagination. 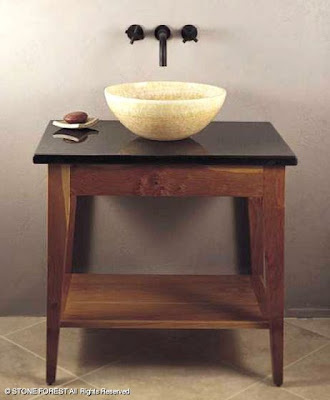 Each of these pieces is carved from a single piece of granite, marble, onyx, basalt, sandstone, travertine and what ever other stone they can get their hands on. The work the do is amazing. Here's some of what I'm talking about. 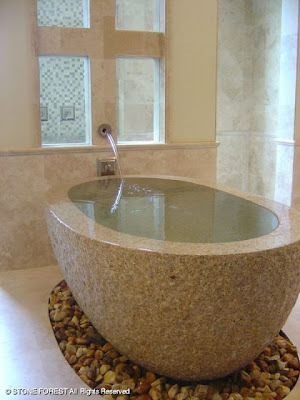 The sinks are a real achievement, but check out these tubs. Man! 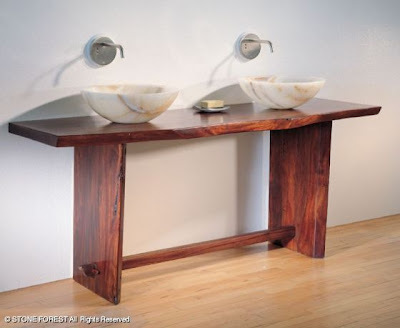 I'd be curious to know how well these bamboo sinks hold up over time. I don't have any first hand experience with them. I think they're really beautiful. What do you think gang? 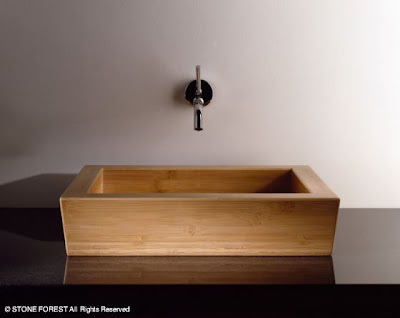 Would you use a bamboo sink? Jerry, you've done really well for yourself over the years but I have to tell you, I envy you your sinks. It's quite a distance from that awful bathroom in Tower B, but it's been a pretty cool journey. You can see the rest of the Stone Forest collection on their website. I know those towers! Interesting angle, though; I haven't seen that one. Actually, I remember them being built - and going to ball games at Forbes Field. Are you from Pittsburgh, too, Paul, or did you just go to to school there? As to Stone Forest, I lurve, lurve, lurve their products! 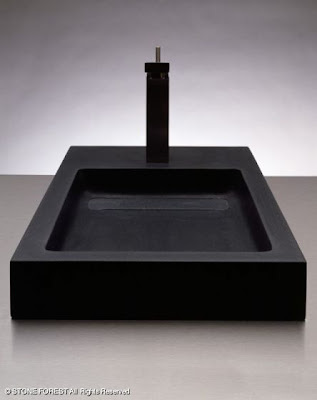 I think a bamboo sink will probably hold up very well, at least as long as it's used regularly. Bamboo is an amazing material for many reasons, and will maintain its watertightness just fine, as long as it's kept moist enough. If allowed to sit empty for a long time, I wouldn't bet that it wouldn't leak like sake cups that aren't used for a while, though. I'd also be willing to bet that the sinks have some kind of waterproof finish, too, that would protect against that drying out. Strength-wise, bamboo is stronger than oak by something like 4 times, and is used just fine as a building material in Asia and other parts of the world even for relatively tall buildings, and certainly as scaffolding. Ain't nothin' out there going to destroy anything made of bamboo that wouldn't also destroy anything else. Wendy: Near as I can tell, that shot of the towers is taken from Thackery Street. Fifth Avenue is at the bottom of the street here and you can see Forbes Quad in the background. I am not from Pittsburgh originally, I just went to school there. I swear, for a small city, it has more than its share of architectural gems. You're from Shadyside? Right? I'm insane for Stone Forest, yes. 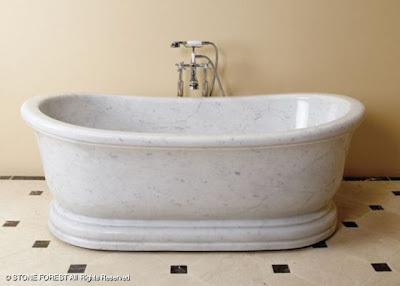 Those marble tubs just send me. I LOVE the second tub. I'm all about the third one. Give me marble or give me death. 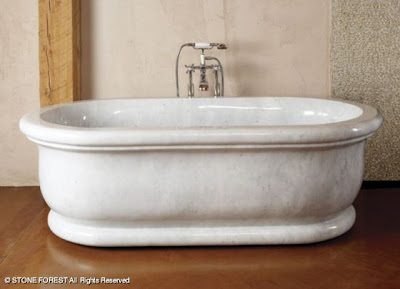 I swear, that tub would make me feel like Augustus himself. Oy, I just found this again and your reply after all this time. Yes, I'm from the 'burgh - Squirrel Hill. 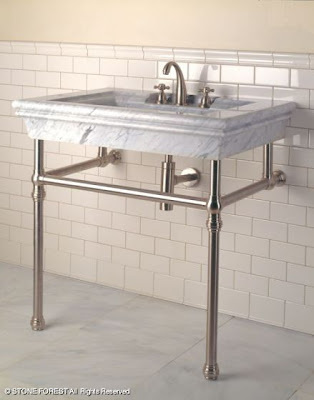 I'm still swooning over their sinks and tubs. 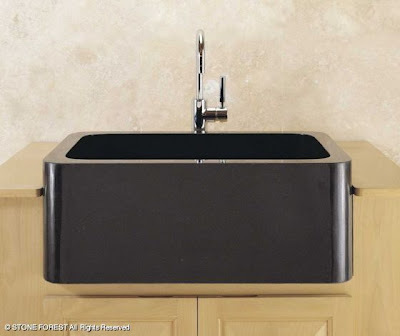 So have you tried bamboo sinks yet?